2010 American Eagle Gold and Silver One Ounce Bullion Coins will go on sale beginning January 19, 2010, the United States Mint told its authorized purchasers on Tuesday. 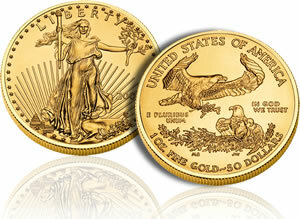 In what can be described as roller-coaster of availability due to enormous demand for 2009 bullion Eagles, this news comes as an affirmation of at least an attempt by the US Mint to keep supplies available. The Mint, however, also states that the allocation process will be in place upon their introduction. This is not surprising to most as the Gold and Silver Eagles have seen temporary suspensions this year and were under allocation through most of the first half of 2009. The most recent suspensions happened only last month, and the return of the one-ounce bullions was not seen until recently. Fractional Gold Eagles also saw excitement. After having been in a release holding pattern for much of the year, the Mint issued 1/2, 1/4, and 1/10 oz sizes on December 3, 2009 to record sales. In a single day, the Mint recorded transactions bringing the numbers to a level near what was sold in all of 2008. The very next day the Mint announced that the 2009 inventory of 1/10 oz coins sold out, and it began allocating the 1/4 and 1/2 oz coins. On December 14, all the fractionals were available once again (still based on the allocation program) but the Mint stated that "no additional inventory" would be produced. Nothing is known yet as to the availability of 2010 fractional Eagles or the Buffalos, with the Mint stating on Tuesday that they will make that information available later. For the remaining supplies, the Mint said it "will continue allocations of 2009 American Eagle Gold and Silver One Ounce Bullion Coins through the end of the year and into 2010 as long as inventories remain." To those who keep up on the Mint’s procedures, the late availability of the 2010s is somewhat of a departure from normal. The Mint typically halts production of a current year bullion coins by late November to begin production of the next year’s issues, leaving on-hand supplies to fulfill demand. However, as the Mint has never really been able to build a sizeable bullion coin stockpile this year, they have been forced to continue striking them into December. Consequently, when the Mint starts selling the 2010 coins in mid-January, it can only do so at the same level they can be produced, resulting in the continuation of the allocation process until demand retreats or the Mint acquires sufficient coin blank supplies. THE USA MINT DIDN’T ORDER SILVER PLANCHETS TO MEET THE DEMAND OF CUSTOMERS BECAUSE THEY WILL CHARGE MORE FOR THEIR COINS BY DELAYING PRODUCTION. JUST ANOTHER PLOY FOR THE MINT TO MAKE MORE MONEY. WHOEVER US IN CHARGE OF ORDERING PLANCHETS SHOULD BE FIRED! One certainly has to wonder how any business that is run can fall short of stock to fill orders the way the mint does,(with regularity) These economic times aren’t what they used to be but, some things never seem to change.Falling dollar,gold and silver prices/values on the rise,didn’t think it was so hard to figure out?I’m picking up bullion as much as I can and lots of people I know are purchasing it too.Manipulating the market by controlling the inventory isn’t a new concept.Makes some people want to purchase foriegn bullion instead,less problems.What’s worse,losing a good customer or not getting a new customer? Apparently it doesn’t matter to some. I am buying pennies by the pounds even rare ones these sellers are dumping it all.